We do offer a local delivery service. If you would like a price based on where you would like delivery to be made to, please contact us. 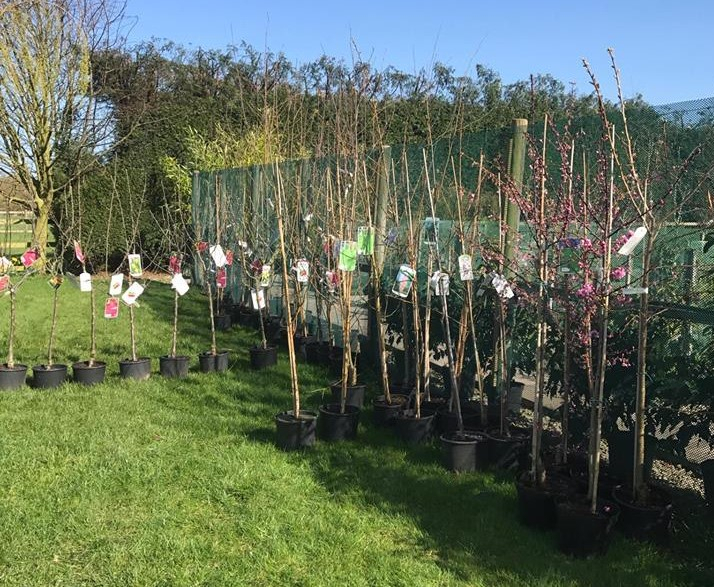 We have our widest selection of fruit trees available in the Spring months, we sell container grown so they can be planted at any point during the year, but late Autumn and early Spring are the best times for healthy establishment. All trees should be staked and secured to the stake with a suitable tree tie. We always have a range of types and sizes available. Our tree planting guide is available to download here. If you would like to order a tree for next Spring please let us know. Malus domestica - Family Apple (three varieties grafted onto one tree) - Girth 10cm. Cox's Orange Pippin; Spartan; Sunset. 30 Litre Pot £65. Cox's Orange Pippin - The original Cox with all the qualities expected from the finest flavoured apple in the world. Orange flush over greenish-yellow. Deep cream flesh has sweet aromatic flavour. Spartan - A very popular eating variety. Fruit dark red, sweet, juicy, crisp with a white flesh. Sunset - similar to Cox but more disease resistant and slightly earlier. Red stripes and Orange flesh over gold. Sharp intense flavour. Heavy cropper. Excellent garden apple. Malus domestica - Cox's Orange Pippin Self Fertile. MM106 rootstock. 10 Litre Pot. Heavy crops of the best eating apple in the world. SOLD OUT. Malus domestica - Cox's Orange Pippin Self Fertile. M27 very dwarf rootstock. 10 Litre Pot. Heavy crops of the best eating apple in the world. SOLD OUT. Malus domestica 'unknown variety' MM106 rootstock. 10 Litre Pot. £20. A very healthy tree, unfortunately lost its variety label so we can't be sure what it is until it fruits, hence price. Malus domestica 'Fiesta'. 10 Litre Pot. £30. X of Cox's Orange Pippin x Idared. Rich, aromatic and sweet with a crisp texture. Excellent garden tree with Cox-like characteristics. Very heavy crops. Malus domestica 'Gala' MM106 rootstock. 10 Litre Pot. £30. X of Kidd's Orange Red x Golden Delicious. A reliable cropper of good, small, crisp and well flavoured fruit with a thin skin. One of the most popular eating apples. Malus domestica - Family Apple (three varieties grafted onto one tree) - 10 Litre Pot. Cox's Orange Pippin; Bramley's Seeding; James Grieve. SOLD OUT. Bramley's Seedling - The finest cooker in the world! Green to greenish yellow with a strong acid flavour. James Grieve - Savoury, crisp to melting flesh; when cooked keeps shape, with juicy, delicate flavour. Season of use is from September to October, and longer. Malus domestica - Family Apple (three varieties grafted onto one tree) - 10 Litre Pot. Discovery; Cox's Orange Pippin; Bramley's Seedling. SOLD OUT. Discovery - X of Worcester Pearmain x Beauty of Bath. Bright red flush. Crisp and juicy with a hint of strawberry. An excellent early dessert apple with good disease resistance. Malus domestica- Family Apple (three varieties grafted onto one tree) - 10 Litre Pot. Egremont Russet; Cox's Orange Pippin; Discovery. 2 In Stock £36. Egremont Russet - The flesh is cream, tinged yellow, sweet and firm with a rich nutty flavour. The usual russet to be found in shops. Spartan - A very popular eating variety. Fruit dark Red. Sweet, juicy, crisp with a white flesh. Laxton's Superb - X of Wyken Pippin x Cox's Orange Pippin. Sweet and aromatic possessing certain similarities to Cox. Purple flush and red stripes gives this an old fashioned attractive appearance. Click on the picture for our tree planting guide. Pyrus communis 'Buerre Hardy' 30 Litre Pot - Rootstock Quince C - £60 - Girth 12cm. Medium - large, light green almost covered with bronze russet. Rough skin. Tender and juicy with rose water flavour. Good cropper. Vigorous tree and good for poor soils. 2 In Stock. Pyrus communis Family Pear (3 varieties grafted onto 1 tree) - Conference; Williams; du Comice. 10 Litre Pot. SOLD OUT. Pyrus communis 'Williams' Bon Chretien' 30 Litre Pot - Rootstock Quince C - £55 - Girth 8cm. A good early eating variety, medium large, pale green turning to golden yellow. Very juicy and sweet. Regular good cropper. Prunus Czar. St Julian A Rootstock. 10 Litre Pot. 'Czar' is a compact, reliably fruiting, self-fertile culinary plum growing to 4-5m in height. White flowers in spring, fruits very deep blue in early August. SOLD OUT. Prunus Victoria. Pixie rootstock. 10 Litre Pot. 'Victoria' is a reliably fruiting, self-fertile dessert and culinary plum to 2.5-4m in height. Flowers white, dark red fruit in August-September. SOLD OUT. Prunus avium 'Sunburst'. Colt Rootstock. Self Fertile. 10 Litre Pot. X of Van x Stella. Large fruit, sweet with great flavour and texture. Self fertile and easy to pick. SOLD. Prunus avium 'Stella'. Colt Rootstock. Self Fertile. 10 Litre Pot. X of Lambert x JI2420. This was the first self fertile sweet cherry to appear that set a standard for modern high yielding varieties for garden and orchard. A large dark red, reliable, sweet, juicy cherry with good flavour. SOLD OUT. Prunus domestica 'Old Green Gage' St Julian A rootstock. 10 Litre Pot. Excellent old fashioned flavour, good for eating, ready in Mid August. Partially self fertile. SOLD OUT. Mespilus germanica - Medlar 'Nottingham'. 30 Litre Pot. Girth 8cm. £65. An attractive small tree, flat topped, with a spreading semi-weeping habit. The small russet fruits can be eaten when fully ripe from October onwards. Even when quite young the tree takes on a picturesque and architectural appearance. The flowers are large and pure white and the large leathery leaves turn a lovely russet-copper colour in autumn. Morus nigra 'Wellington' - Black Mulberry. 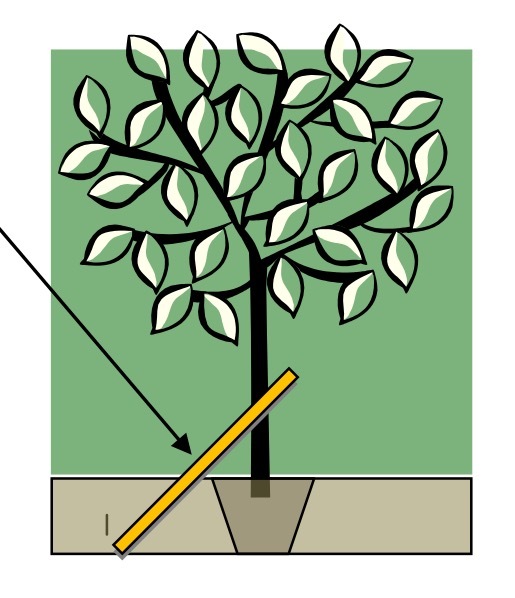 10 Litre Pot A spreading tree with dark green leaves, velvety underneath. Cup shaped green flowers followed by green fruit ripening to red and then dark purple. 1 In Stock. £30. Quince Vranja - 10 Litre Pot. Large, pale, green-yellow fruit. High in nutritional benefits for fatigue. Lovely soft pink flowers and large leaves. SOLD OUT.